I never could have predicted that cauliflower would become what it is today. Who knew that it would surpass kale in popularity? (Although 20 years ago, did you ever think kale would be a thing?) I mean, there is nothing that cauliflower cannot do! We can steam it, blanch it, roast it, grill, puree it like potatoes, rice it and that’s just the beginning. We can turn it into a pizza crust, an alfredo sauce, pack it into smoothies, combine it (or not) with oats into oatmeal, form the basis of a great taco, and we can even make a “steak” with cauliflower. Ok, maybe it’s not a real steak, but you get the picture. 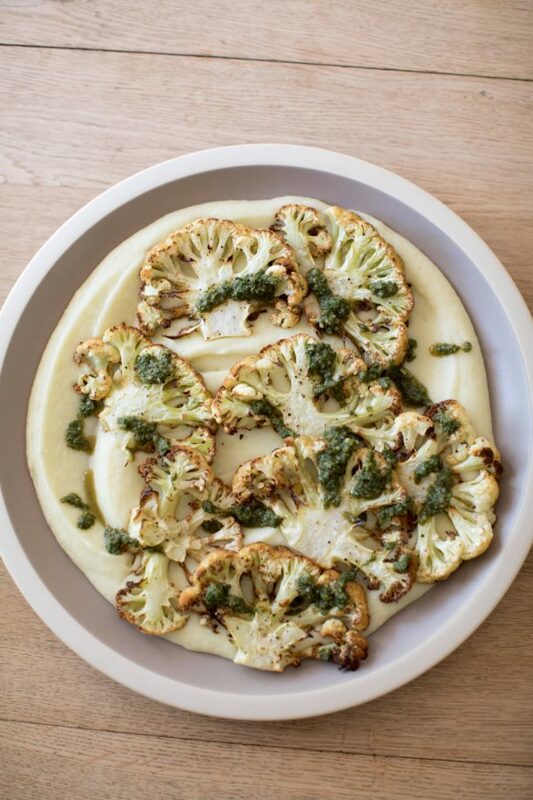 Cauliflower is the common bond amongst vegans and Paleo followers: cauliflower replaces steaks for the vegans and grains for the cavemen, ahem Paleo folks. And this is a vegetable we can all get behind because it is so darn nutritious. Coincidentally, cauliflower and kale are part of the same family, the Brassicas, aka the Cruciferous family of vegetables which are super nutrient-dense foods – loaded with nutrients and anti-inflammatory and cancer-fighting compounds. I always advise my students to try to incorporate a few of these veggies into their meal plan a few times a week. Think broccoli, all the cabbages (kale is a cabbage FYI), Brussels sprouts, bok choy, radish, watercress, arugula and others. I originally taught this recipe at Jenni Kayne’s house for an Easter brunch class, but I have made this for a Meatless Monday dinner for my family (it’s actually really simple! ), as well as for friends with a whole roasted chicken. It would be lovely for Mother’s Day. You can absolutely serve any kind of pesto or your favorite sauce, but mint is so spring-y, isn’t it? If you’re not convinced to make this, check out the video below which shows you how easy it is! Preheat the oven to 400 degrees. Line a large baking sheet with unbleached parchment paper. Prepare the cauliflower steaks: Trim away the big outer leaves from the cauliflower and trim the bottom stem end. With the stem end facing up, cut through straight through the middle of the core. Trim the rounded side on each half that isn’t cut, keeping the core intact, giving you two “steaks” with flat sides. Reserve the florets that were cut off. A large head of cauliflower might yield 3-4 steaks. 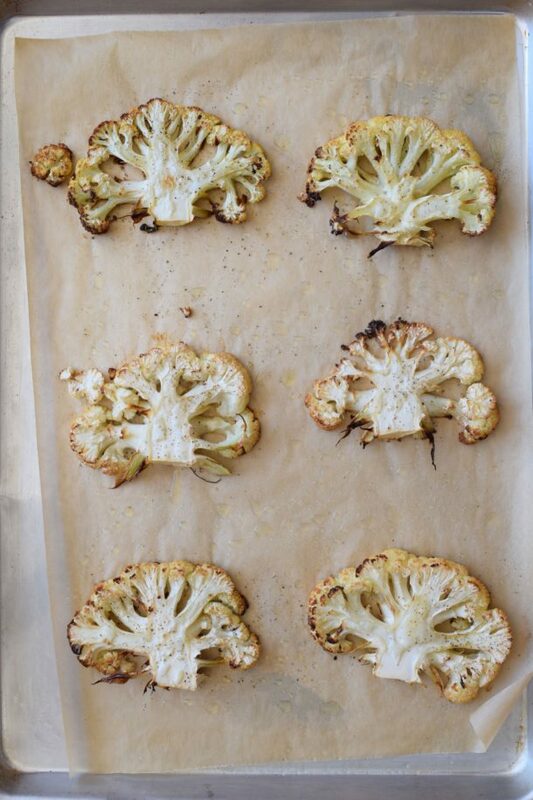 Arrange the cauliflower steaks on prepared baking sheets. Brush both sides of the steaks with olive oil and sprinkle one side with sea salt and freshly ground black pepper. Bake for 25-30 minutes, until tender and golden, flipping over halfway if necessary. To ensure the cauliflower is tender throughout, use a pairing knife to pierce the center core of the steak. It should go in easily without any resistance. Meanwhile, place 5 cups of the reserved cauliflower florets in a large pot with the potatoes, a pinch of kosher salt and enough water to come just below the top of the vegetables. Bring to a boil over high heat and then lower to a simmer. Cook until tender, about 15 minutes. Drain cauliflower and potatoes and transfer to the bowl of a food processor fitted with the metal blade. Add butter and salt and process until smooth. Taste for seasoning. To make mint pesto, process nuts and garlic in a mini food processor until finely chopped. Add the mint, salt, and pepper and pour oil on top. Process until well blended. Add additional oil to achieve desired consistency. To serve the steaks, smear a spoonful of the cauliflower/potato puree onto each plate. 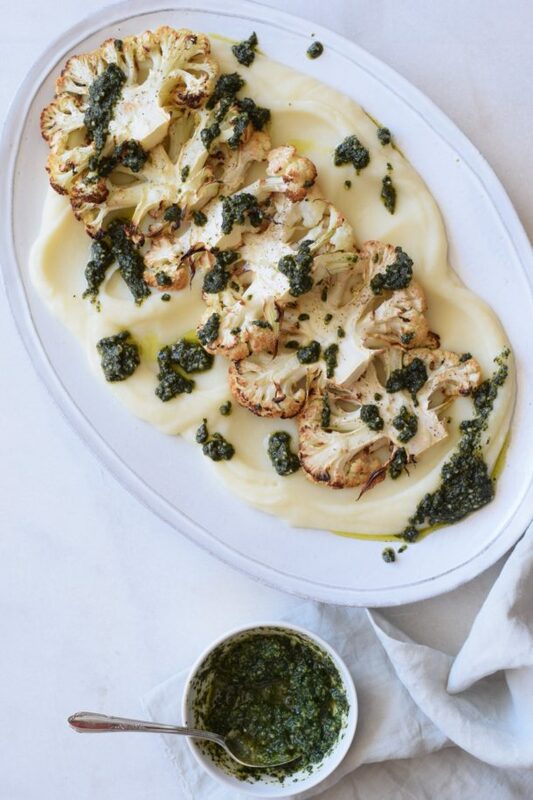 Place a cauliflower steak on top and drizzle each with mint pesto. Serve immediately. Pesto can be made several days in advance and kept refrigerated or frozen. Place it in a jar with as little air at the top of the jar as possible to prevent oxidation. Had this for dinner tonight. Fantastic! I made this last night and it was so delicious! Hubby and oldest both loved it, too. Thank you, Pamela! Excited to spread the leftover on mint pesto on toast! Great news! Mint pesto forever!